GILLIAN CANDLER is an award-winning writer with a passion for the natural world and the great outdoors. 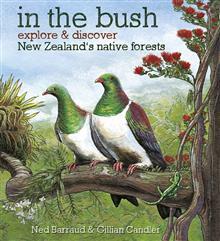 She has written three other books in the 'explore & discover' series, all illustrated by Ned Barraud. She has a background in publishing and education and now writes full time. Gillian regularly leads walks for Forest and Bird and enjoys tramping in the New Zealand bush and learning more about the animals and plants that live there. She works as a volunteer maintaining and clearing stoat and rat traps in a reserve at Pukerua Bay where she lives. NED BARRAUD is an illustrator with a keen passion for the natural world. He illustrated the three previous titles in the award-winning 'explore & discover' series, along with his first children's fiction title, Moonman (2014). When not illustrating, he works on films at Weta Digital as a texture artist and enjoys exploring the outdoors with his wife and three children.